Speaker Joe Straus and Lt. Gov. Dan Patrick, both Republicans. Cook gave that personal privilege speech about how the environment in the House had become toxic under Craddick’s dictatorial leadership, which would have perfectly laid the groundwork for another member to rise and make a motion to remove the Speaker. No member was recognized for such a motion, Cook’s words hung in the air, and House lawmakers went on about their daily business. It was not until 2009 that Chairman Cook and the other GOP “Cardinals” formulated their plan to topple Craddick with the assistance of Democrats and the rest is, at this point, somewhat forgotten Texas Capitol history. Many freshman and sophomore members of the House don’t have that memory in their file nor do they have the governance of any speaker other than Joe Straus for reference. Prior to Straus’ surprise announcement on October 25 that he would not seek reelection, some in the business community made the case to him that if he was going to run once more, he would really need to run twice more. The House needs a steady leader for the next redistricting cycle coming up in the 2021 session so that maps can be drawn that still, naturally, give the partisan advantage to the Republicans but don’t make it nearly impossible for the governing party to govern. Since the initial publication of this analysis, it was pointed out by a sharp reader that Speaker Straus was largely hands off when it came to redistricting in 2011. The pitch from business leaders to Straus was that he’d need to be deeply involved next time around. Senate Bill 4 – the “show me your papers” immigration law – and the bathroom bill debate are merely symptoms of the disease caused by districts that with some exceptions do not reflect communities of interest. As much as some in the lobby and those outside the Austin bubble now say they loathe Lt. Gov. Dan Patrick, it is difficult to fault him for being the best practitioner of politics in Texas. Patrick plays the balls as it lies, not as he wishes it was, because he understands how to adapt to a political environment in his quest to consolidate power. No one does it better in these parts. When it comes to the 600,000 or so voters of consequence in a state of nearly 28 million people, Patrick is like the dad who lets the kids eat cake and candy for breakfast when mom is away. Straus is responsible, allowing for candy consumption in amounts that aren’t nearly as bad for you. And hell, he even serves veggies to the kids. The idea that the battle for the soul of the Republican party is centered around a question of “more conservative” versus “more moderate” has not been the case in Texas. Yes, we have Republicans of many ideological stipes. But the real tug of war has been between the reckless versus the responsible while the occupant of the Governor’s Mansion makes little if any attempt to referee the situation. Since the mid-decade redistricting of 2003 done at the behest of former US House Majority Leader Tom DeLay and Speaker Craddick, the majority has fostered the dysfunction on full display in the 2017 regular and special sessions and, to a lesser degree, during the regular session in 2015.
Business interests were routinely ignored in the Texas Senate when sounding the alarm about economic collateral damage from discriminatory legislation, law enforcement’s pleas fell on deaf ears during votes to ease restrictions on firearms in public places, and construction executives were given the cold shoulder while many of their documented Hispanic workers are now fleeing to other states for fear local cops here will round them up. By announcing he will leave office on his own terms with $10 million cash on hand, Straus has set the stage for what could be – but not necessarily will be – the most orderly transfer of power possible during one of the most tumultuous times ever seen in state and national politics. Privately, many Republicans who will surely miss Straus’ leadership will not miss the injection of his name into their races. It’s possible Straus saved as many as 5 or 6 “rational Republicans,” as he called them, or at least made their races a little or a lot easier. 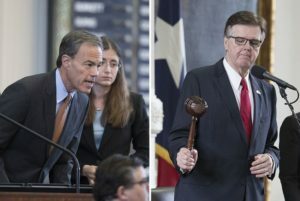 Speaker Straus did the very thing Chairman Tim Dunn’s Empower Texans was never able to accomplish: Create a competitive race for speaker – and one in which a responsible Republican has a shot at holding the gavel in 2019 and again in 2021. The Saint Crispin’s Day speech that Chairman Cook, also now retiring, invoked a decade ago about the “band of brothers” was given before the battle began, looking ahead to what would unfold next if those of like mind would stick together and fight the good fight. In Shakespeare, Saint Crispin’s Day was October 25. Scott Braddock is a journalist and political analyst based in Austin.